I have to introduce and conclude this next parable with the text surrounding it because it is so beautiful. The story of St. Mary Magdalen is one close to my heart. And one of the Pharisees desired him to eat with him. And he went into the house of the Pharisee, and sat down to meat. And behold a woman that was in the city, a sinner, when she knew that he sat at meat in the Pharisee's house, brought an alabaster box of ointment; And standing behind at his feet, she began to wash his feet, with tears, and wiped them with the hairs of her head, and kissed his feet, and anointed them with the ointment. And the Pharisee, who had invited him, seeing it, spoke within himself, saying: This man, if he were a prophet, would know surely who and what manner of woman this is that toucheth him, that she is a sinner. And Jesus answering, said to him: Simon, I have somewhat to say to thee. But he said: Master, say it. A certain creditor had two debtors, the one who owed five hundred pence, and the other fifty. And whereas they had not wherewith to pay, he forgave them both. Which therefore of the two loveth him most? Simon answering, said: I suppose that he to whom he forgave most. And he said to him: Thou hast judged rightly. And turning to the woman, he said unto Simon: Dost thou see this woman? I entered into thy house, thou gavest me no water for my feet; but she with tears hath washed my feet, and with her hairs hath wiped them. Thou gavest me no kiss; but she, since she came in, hath not ceased to kiss my feet. My head with oil thou didst not anoint; but she with ointment hath anointed my feet. Wherefore I say to thee: Many sins are forgiven her, because she hath loved much. But to whom less is forgiven, he loveth less. And he said to her: Thy sins are forgiven thee. And they that sat at meat with him began to say within themselves: Who is this that forgiveth sins also? And he said to the woman: Thy faith hath made thee safe, go in peace. 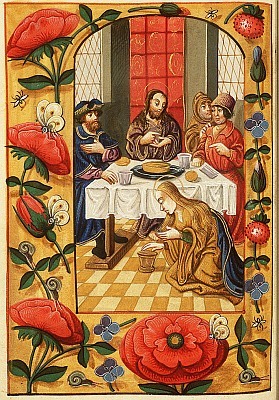 In St. Luke the two debtors is spoken by our Lord to Simon "the leper" (Mark 14:2-9) on occasion of Mary Magdalene's conversion, with its touching circumstances. At least since St. Gregory the Great, Catholic writers have so understood the history. The double saying "Many sins are forgiven her, for she loved much", and "to whom less is forgiven, he loveth less", has a perfectly clear human sense, in accordance with facts. We cannot deduce from such almost proverbial expressions a theory of justification. The lesson concerns gratitude for mercies received, with a strong emphasis on the hard arrogance of the Pharisee over against the lowly and tender bearing of the "woman who was a sinner".